25% off sublimated hockey jerseys and customizable jerseys, minimum 12. Discounted prices shown below. All lettering and logos are included in the price, in as many colors as you want, even the individual's name on the back. You can use any color combinations you want, all colors are available for custom jerseys. Production time is 14 days, we can do it in 7 days for an additional charge. 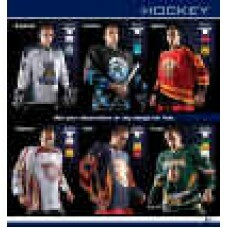 If these are beyond your price range, try the stock hockey jerseys that can ship today. You can add custom lettering to the softball uniforms. Size chart Features : Steelmesh 2 fabric provides comfort and performance , Steelmesh 2 provides the..